I am supposed to be making soaps... and cheese... and sorting my studio to attempt to get back into anything that remotely resembles a creation schedule. I have dishes to wash. I have recipes to share about dilly beans and salsa. None of these are getting done. It is 12:13 pm and I am alternately sitting here staring at this blank screen, writing and rewriting what I hope are the right words and popping up to wander the house haphazardly to this task or that, accomplishing absolutely nothing. All of this punctuated by randomly tearing eyes hastily wiped dry in favor of some other task for my hands. Except, as I have already confessed, nothing is actually getting done. So, here I sit once more. Perhaps this time I can get it all down. In another life and at another time, I (Sonja) owned a child daycare in Searsport, Maine. Always having had a family dog growing up, I thought it an important love to pass onto my own children. Finding the perfect dog for us was difficult, since there were few breeds available to own while operating a child care- all the large breeds that I loved were prohibited. 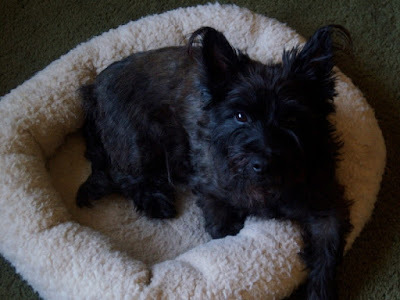 After much research, we decided to try to find a cairn terrier. We contacted our local animal shelter asking to be contacted if a male, 6 month- 2 year old Cairn came in. It took nearly 2 years, but the call came and we met Angus. That was 11 years ago. Since then, the daycare closed, we moved to a new home twice, I became an HR/Marketing Manager, Sean married us, and together we built this homestead and started Lally Broch Farm. Angus was there all the time. His faithful companionship got me through a difficult divorce, a change in homes and employment and together we found a love in Sean that we never knew we could have. It was a two-way street. Angus needed us, too. We cared for him through a broken pelvis (dog vs car; car won) where he spent 6 weeks wrapped and immobile. We used a towel to sling his back end so he could relieve himself and cleaned the messes when he couldn't make it. Angus developed food allergies and needed to be fed a special diet to help with dermatitis and hair loss. There were days that boy was a hot mess! About 4 years ago, Angus could no longer control his bladder, but he was spry and not in pain, so we made some accommodation for him. We tiled the laundry room floor and converted it to a dog room with access to a large fenced in yard. We adopted Buster to be a constant companion for him. In the last year, Angus became completely blind. But, even that did not stop him. Two weeks ago, we watched him chasing the Black Swedish ducks around the yard by sound. If they were quiet, he ran right past them unless we called him back to us or he bumped into another obstruction. If they quacked, he turned towards the sound and the chase was on! (Lest we get some outraged readers on this one: there was no way on earth that he was going to be able to catch a duck to harm it. At a slow stroll they out-paced him by a mile. But, it gave him a little sport to think he was on the trail of something.) On one especially good day, he wandered into the wooded land behind the house, refused to come back to our calls and forced Sean to go in to find him and carry him home. He was so pleased with himself, he decided to give Molly some male attention. The fact that he had been neutered for 11 years and that Molly stands a good foot and a half taller than he made no difference to him! For the past 2 years, Sean and I discussed what to do when it was time to make the difficult decision to lay Angus to rest. Every person has their own opinion about it. For us, the time would come when Angus was in pain or when he could no longer function. Often I prayed that Angus would pass in his sleep so that it did not become up to me to make that call. Two nights ago, Angus could not navigate the stairs to come inside on his own and Meaghan had to carry him inside. Last night, he could no longer stand under his own power. The time had come. This morning, Sean called our vet and made an appointment to have him seen. Dr.Emerson agreed. There was no medicine that was going to prolong Angus's 14 year-old life or help him regain his ability to walk. There was really no choice. I held him and pet him, saying, "It's okay. You're a good doggie, Angus" while she administered the two injections that laid Angus to rest. 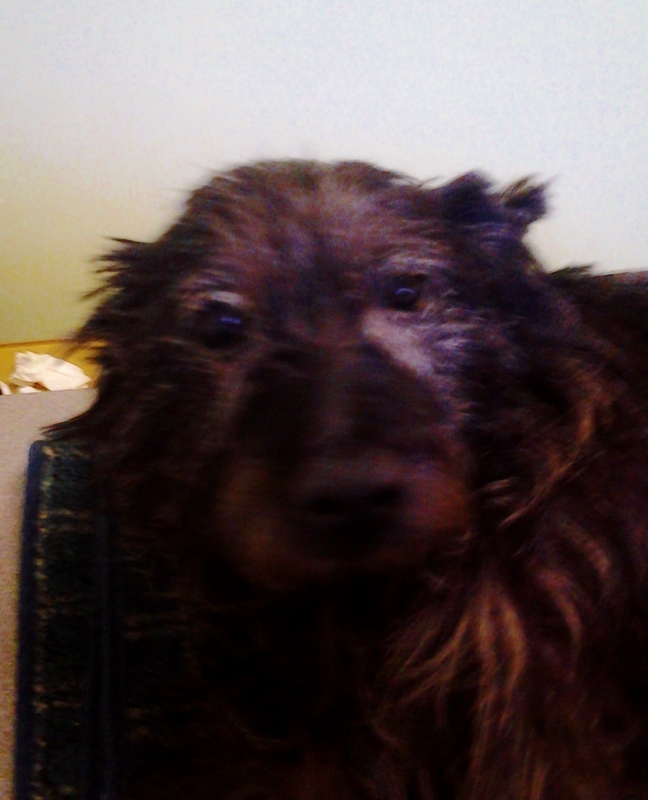 His passing was quick and painless, but the feeling in my heart is neither. I brought a box and blanket with me in preparation for this outcome. Since the office was packed with people and busy, I did not want to alarm them by carrying Angus out in my arms. With tears running down my face, I barely registered a stranger's query to me, "What do you have in the box?" as I walked quickly past. She repeated to the receptionist, "What does she have in the box?" I didn't pause, but in my head, I said, "One of my best friends." I know she didn't mean anything rude by it. She probably thought I had kittens or some other creature, but I was in no mood to be civil. I'm still not, to be honest. Until that passes I will stay off of facebook and refrain from answering the telephone. When Sean returns home from work, Angus will be interred in a special place in our yard and a garden of flowers planted there to mark his resting place, though the memories of him will live in our hearts and minds. He really was a good doggie. Hello, this is Meaghan writing now. I've decided to say a few things in remembrance of my dear friend. But one of my most fondest memories will always be Angus's desire to be a hairdresser. You don't believe me? No really. If you were laying supine, all of a sudden he'd come up behind you and just start biting your hair. And it didn't even matter if you weren't laying down (Well, it did to me: I had short hair,) he'd bite your hair if it was long enough for him to reach. I regret having to say my farewell to such a companion. I'm so sorry you lost your special boy! I hope that you and your family find peace soon and are able to remember Angus with smiles instead of tears. We are sending love to you all! So sorry to hear about your special Angus. I am glad you shared this post. We have been through a loss like yours a few times in our 45 years of marriage and the hearts are till tender with memories but those memories hold lots of joy and laughter too and I hope this bitter sweet time with pass softly for you all. You are in our prayers. Aw Sonja, I'm sorry! Pets are such a big part of our family and they leave us much too soon. I can tell he was a funny and wonderful companion. I am sitting her crying and snotting, you know how I roll. I am sooooooooooooooooo sorry for your loss! He was a special dog, and I am so happy he got to spend his life with such a special group of folks!!!!!!!!!! Thank you for sharing Angus story, it is so hard to lose a pet who is so much more than a pet and is part of your family. I hope you find peace and comfort in your cherished memories of Angus. I am so sorry for your loss. I will be facing the same decision soon. My almost 13 year old collie is failing fast. I just think of all the good years we have had together and hold on to every day.